The Genie S-85 XC ... more lift. Genie has expanded its range of Xtra Capacity (XC) telescopic boom lifts with the new S-80 XC and S-85 XC booms that include new features to help increase productivity and efficiency, with their ability to perform a wider range of heavier lift tasks on construction and industrial jobsites. The models were premiered at Apex 2017, an access platform exhibition, held in Amsterdam, the Netherlands, last month (May 2 to 4), and will be available at the end of Q1 2018. Both models feature automatic envelope control, which enables them to automatically retract as the booms reach their operating envelope, allowing for simple platform positioning and an enhanced operator’s experience. Also, they are equipped with a load sense cell that continuously checks the weight in the platform and limits the operating envelope to match the load chart, all while boasting the ability to do zero-load field calibrations. To support additional weight in the platform, the Genie S-80 XC and S-85 XC are engineered with a redesigned boom structure that boasts increased performance, range of motion and envelope control, as well as a robust jib capable of easily handling the 454 kg maximum capacity. The booms also have been updated with a state-of-the-art CAN-based ALC600 control system (replacing the earlier ALC500). “Altogether smarter, both technicians and operators will find the new ALC600 much simpler and more straightforward to use,” says a spokesman for Genie, which is a Terex Corporation brand. “Marking a significant improvement in terms of diagnostics and troubleshooting capabilities, the settings and parameters can now be modified directly on the machine without the need for additional tools. “Overall connectivity with customer telematics systems is also enhanced. New and improved features include a clear display of gauges on the display controller, new full error code readouts with text, as well as a service mode providing clear menus for settings and parameters,” he adds. For added flexibility, with the new ALC600, software updates can now be performed directly from the control panel without the need for a laptop computer via USB. Technicians also benefit from password-protected fault logs that display the last 100 faults for both the engine and the machine. • 360-degree continuous turntable rotation for quick positioning. The S-80 XC model boasts a 26.38-m working height with 20.83 m of outreach; while the S-85 XC has 27.9 m working height with 22.71 m of outreach. 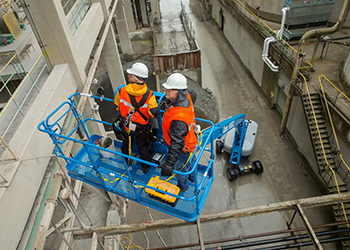 The XC design on these boom lifts also includes a 1.83 m or an 2.44-m tri-entry platform with side-swing gate to make it easy to get people, tools and jobsite materials in and out of the basket. These booms’ XC features give customers the ability to work with up to three people onboard while still leaving room for tools and jobsite materials. Genie is part of Terex Corporation, a global manufacturer of lifting and material processing products and services.